Originally published in The Forward on May 1, 2014. I’ve watched as millions and millions of dollars have been poured into youth leadership programs, summer camps, Taglit-Birthright trips and other “big initiatives” to foster identity amongst young Jews. And I’ve grown up listening to my parents’ and grandparents’ generations worrying that the Jewish community will collapse when my generation comes of age. 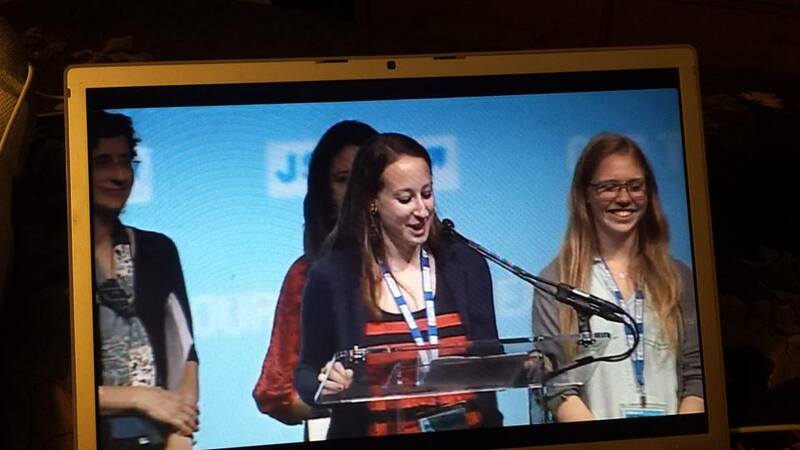 Well, when my friends and I, many of us products of such communal initiatives, watched as the Conference of Presidents voted to exclude J Street from their membership, we heard a loud and unambiguous message: the voices of thousands of young Jews are unwanted. It’s not very complicated: The fastest way to get Jews to disengage is through votes like this. The Conference of Presidents vote was not a referendum on J Street representing thousands of American Jews. It was, however, a referendum on whether the Conference of Presidents wishes to be a relevant and representative body to American Jews. While secret balloting and closed-door meetings might work for the 1950s old boys’ clubs, today it signifies weakness and decay in the Jewish community. The Conference of Presidents is supposed to be comprised of organizations with grassroots bases in order to be accountable to the American Jewish public. But an intentionally opaque voting process undercuts the Conference’s supposed representative mission and is an affront to the individuals these groups purport to represent. For example, despite the involvement of many dues-paying AEPi brothers in J Street U, AEPi is not revealing whether its leaders voted against giving their students a seat at the table. Similarly, the JFNA represents Jewish communities across the U.S., with thousands of J Street U students coming under their representative umbrella. We deserve to know if our institutions voted to bar us from admittance. Why are these organizations afraid of transparency? While some will try to assert that this vote proves that J Street is out of the mainstream, I’d suggest checking in with Jewish students on campus. Not everyone agrees with us, but most students believe in a representative community based on the values we learned at our synagogues, Hebrew Schools, and summer camps. Similarly, some of the largest establishment Jewish organizations came out in proactive support of J Street’s admission, including the Jewish Council of Public Affairs, the Union for Reform Judaism, the Anti-Defamation League, the United Synagogue of Conservative Judaism, Americans for Peace Now, the Conservative Movement’s Rabbinical Assembly and more. While the final “score” was 22-17, many organizations in the Conference just do not represent a significant American Jewish constituency, though they hold the same voting power. As Rabbi Julie Schonfeld, Executive Vice President of the Conservative movement’s Rabbinical Assembly pointed out, J Street won a landslide of the popular vote. Our work to achieve two states and end the occupation does not end with this vote. J Street U is already in the midst of planning our Summer Leadership Institute, where students from over 60 campuses will gather in August to plan and strategize for the next school year. Every day, more students begin fighting for a community in which our commitments to Israel, to changing broken political dynamics, and to our progressive values work together in concert. As more students recognize that the state of Israel’s future is inextricably tied to the dignity and freedom of the Palestinian people, J Street U will continue to grow. Just as lavish hasbara efforts cannot protect Israel from dealing with its serious existential crisis, neither can votes like the Conference of Presidents protect the Jewish community from wrestling with the changing sentiments of American Jewry, particularly amongst young Jews. I wish they had voted differently, and I’m grateful to and proud of the organizations that did back J Street. But, at the end of the day, our work goes on.